A quiet change has been taking place in the cinemas of South-East England. Not all cinemas, it should be quickly added, but a significant number of them. Although the tide of multiplexes continues to rise, bringing more screens but not necessarily more or better films to show on them, their dominance is not entire. All along the south coast a large number of independently owned cinemas have been opening up in the last few years. Around the Kent coast, for instance, from Sittingbourne down to Folkestone, there are currently eighteen screens showing movies in twelve independently run cinemas. Many of these are housed in refurbished purpose-built cinema buildings, dating back to the early years of the century, and now of significant architectural interest. Further to the west, Sussex has its own independent seaside exhibitors, in Bexhill, Eastbourne and Brighton, with more in inland towns. South-East Arts and the BFI are currently advertising for a co-ordinator to promote and develop the independent venues in Kent. Last year saw the first Kent International Film Festival: ten days of films from directors such as Resnais, Chabrol, Bodrov, Almódovar and de Broca. Although many of these Kentish independent cinemas are regularly putting on programmes in competition with the multiplexes, it is not all wall-to-wall popcorn: Ramsgate has recently seen Tarkovsky’s Solaris, and Todd Solondz’s Happiness played in Westgate on Sea. Brighton is dominated by three multi-screen circuit cinemas: the Odeon with six screens, the ABC with three and the Virgin multiplex in the Marina Village with ten. The Odeon wants to add four more screens, and Virgin have plans for another ten-screen multiplex in Hove, a couple of miles down the coast. The town already seems over-screened, particularly when the actual choice is not all that great – Forces of Nature and Notting Hill are showing in all three of these mainstream venues, and Rugrats, Best Laid Plans and She’s All That in two of them. The argument usually put forward for the multiplex is that it extends filmgoers’ choice. The reality is that a multiplex is led by marketing executives, and the extended choice belongs to the exhibitor. Crowd-pleasers like Titanic can be shown simultaneously on several screens within the same complex so long as the audiences flock in, then cut back at short notice to one or two screens as the box-office starts to slow. An expectation of genuine choice from a multiplex would probably include the idea that at least one screen should be regularly given over to world cinema, American indies, British low-budget features, and so on. Yet the closest thing to an arthouse film in any of the Brighton chain cinemas in the current week is Bryan Singer’s Apt Pupil, showing at the Odeon. It’s hardly surprising then, but none the less pleasing, to find that this diversely populated town has a thriving arthouse cinema, the Duke of York’s. Not exactly an indie cinema as such, being one of a small chain owned by the City Screen group, the DoY manages to be an almost ideal cinema, at least from the point of view of its programming. Although the physical constraints of the building mean it has only one screen, through three daily screenings it runs a varied repertory. The range is genuine. Earlier in May the DoY was showing Cronenberg’s eXistenZ in competition with the multiples, but in the same period it was a venue for Brighton Festival items, reruns of classics like Citizen Kane and The 39 Steps, as well as recent arthouse entries such as Central Station, Orphans and Black Cat White Cat. The Duke of York’s is in a small, elegant building, opened in 1910, and believed to be the oldest dedicated cinema building outside London. 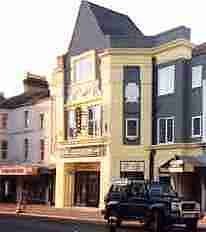 The Curzon Picture Playhouse, in Bexhill, is a comparative youngster, having opened in 1921. There are probably no two towns less alike than Brighton and Bexhill: where Brighton is full of energy, thriving on fastlane streetlife, nightclubs, bistros, two universities, large gay and artistic communities, Bexhill is … Bexhill. People who live in Bexhill tend to be touchy about the town’s image, so I like to quote Paul Theroux. He famously said that in Bexhill he felt safe and dry, but also eighty years old. In Western Road, close by the railway line, is the Curzon Picture Playhouse, a gem amongst cinemas, one whose presence seems barely to impinge on the people of Bexhill. The Curzon is privately owned by Ray Sutton, who runs an almost suicidally arthouse programming policy. He operates it single-handed, with just a part-time usherette (legally required) to run the box-office and sit in the auditorium during a show. “People round here remember the Curzon as the town’s dirty old fleapit,” Sutton says. He has spent thousands of pounds of his own money on improvements – no National Lottery or BFI aid has reached him, unlike at the Duke of York’s. The Curzon now is clean, modern and comfortable, with generous leg-room and a complete absence of popcorn debris or Coke slops making your feet stick to the floor. “I’ll show a film to an audience of one,” says Sutton, knowing it has sometimes come to that. Most evenings he can hope for an audience in double figures, but rarely more than that. A couple of weeks ago the only people who arrived for a showing of Makhmalbaf’s The Apple were a bunch of local yobbos, who urinated in the foyer and smashed the glass showcases. In protest, and some despair, Sutton closed the cinema for the rest of the film’s run. A week later he was back in business, the cinema cleaned and repaired, and with a well-attended run of Gods and Monsters. In the last twelve months the Curzon has shown Japanese, Mexican, Iranian and Portuguese films, most of them prizewinners at festivals. Last Christmas there was a week of Laurel and Hardy, and a rerun of The Big Sleep, a dangerously symbolic title to run in Bexhill. Still the independents appear – later this year the Sussex town of Hailsham will see the opening of the Pavilion. Arts clubs and film groups thrive in towns like Lewes and Hastings. There are even reports that the De La Warr pavilion in Bexhill, the Grade 1 listed art deco palace, might be converted into a part-time cinema. Multiplex cinemas are a triumph of marketing and audience research, but these small local cinemas, converted and modernized, make you feel safe and dry, and eighteen all over again.